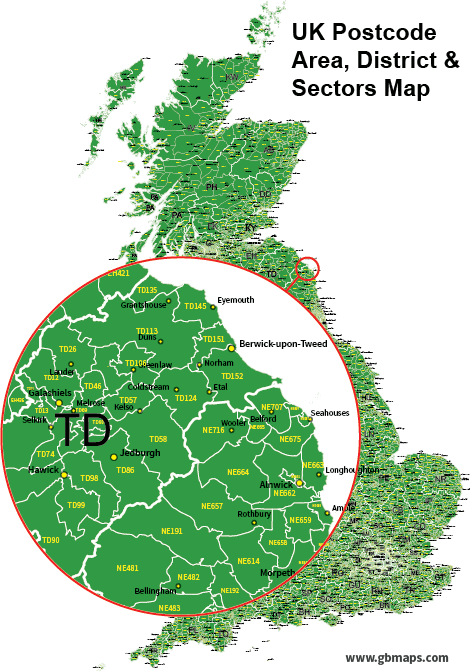 Download FREE pdf postcode area, district, sector maps of the whole of the UK right down to the 5 digit post code sector level. The United Kingdom is divided up into approx 120 different postcode areas. Each postcode area is divided up unto numerous smaller districts, There are approx. 2,800 postcode districts. Each district is further divided into Sectors, there are approximately 9,000 uk postal code sectors. You can download a FREE vector based pdf map of each of the individual GB postcode areas showing the areas, districts and sectors including area name labels and major cities by clicking on the links down th eleft hand side of this page. We give these maps away for free to give you an idea of the level of detail our maps contain. If you the maps useful, please do us a favour in return and have a play with our online postcode map customisation tool. They are really quick and simple to use and you'll actually have fun creating maps with them. You can download a FREE UK postcode map here. Enter your email address(which stops computers automatically downloading the map) and you'll automatically be emailed a link to download the vector based pdf postcode map. This UK Postcode Area Map has all the postcode boundaries in a vector format and also lists all the 2 character postcodes along with the postal town associated with those post code area letters.